What is a Macchiato Coffee? What is a macchiato? Great question! Keep reading to learn everything you need know. If you wander into any respectable coffee shop these days, you’ll be greeted with a host of alluring sounding coffee options. You may be familiar with some, but have you heard of them all? It’s wonderful to have a choice when it comes to selecting your morning blend, but what happens when some of the names on the menu mean nothing to you? Do you plump for tried and tested favorites, or do you take the plunge and try something new? If you don’t want to take any chances and ruin your morning, it’s wise to read up on different types of coffee and find out more about them. If you’re not familiar with the marvel that is the macchiato yet, you’ve come to the right place. This guide will provide you with all the information you could possibly need or want about the macchiato. A macchiato is sometimes known as an espresso macchiato or a caffè macchiato. In the most basic terms, it is an espresso with a dash of milk. The name macchiato comes from Italian, and it means marked, stained or spotted. This description relates to the mark the milk makes when you add it to the dark, rich espresso. The quantity of milk is just enough to lighten the color of the coffee and pierce the smooth, black surface. A macchiato is primarily made from espresso, and it offers an alternative to the classic espresso for those who want a powerful flavor hit with a touch of creaminess provided by the spot of milk. 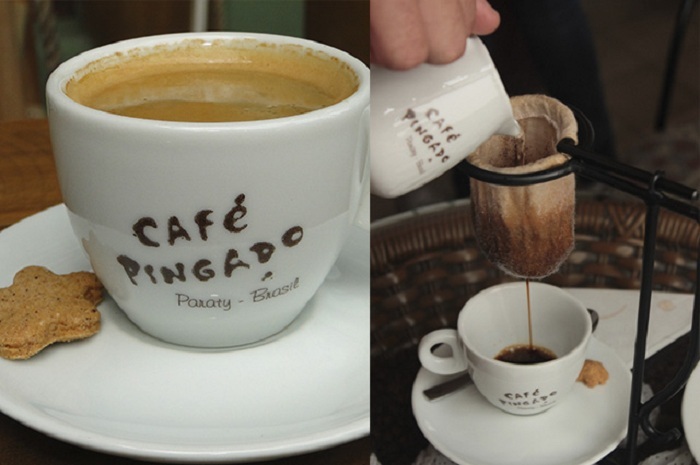 Most countries have adopted the Italian name, but if you’re looking for a macchiato in Portugal, you may need to order ‘cafe pingado,’ which translates as ‘coffee with a drop.’ This relates to the splash of milk. If you search for the term macchiato, you may come across a series of options, including caffè macchiato, espresso macchiato, and latte macchiato (read what is a latte to learn more about this drink). Caffè macchiato and espresso macchiato are the traditional versions, which contain a shot of espresso teamed with a spot of lightly frothed milk. A latte macchiato is a blend of the macchiato and the much-loved milky latte. With a caffè macchiato, the milk stains the dark espresso. With a latte macchiato, the espresso shot stains the pristine white milk. It is thought that the macchiato was born out of a desire to show the difference between the classic espresso and a coffee with milk. Baristas who wanted to signal to the waiting staff which coffee was which would use a spot of milk to distinguish the espresso from the coffee that contained milk. The name macchiato is derived from the Italian word for stained or marked. When you add a splash of milk to an espresso, the color changes slightly and the perfectly smooth surface ripples, so this name seems perfect. Over the years, the conventional macchiato has evolved thanks to coffee shops and chains trying to spice up their menus and diversify their product range. The traditional macchiato contains espresso with a splash of milk, but it’s also possible to order a latte macchiato, which contains a much larger quantity of hot milk. Flavored syrups, such as caramel, can be added to the latte macchiato. This may float your boat, or it may make you recoil in horror, depending on whether you’re a coffee purist or not. How is a Macchiato Made? Any coffee aficionado should pay attention to detail when it comes to making the coffee of their choice. The key to a perfect macchiato lies in getting the quantities right. As the name suggests, this coffee should contain just a splash of milk, which is added to pure espresso. If too much milk is added, you may end up with something more reminiscent of a latte or a cappuccino. The aim is to preserve the bold flavor of the espresso while adding a very delicate, subtle touch of sweetness with a spot of milk. Typically, a single shot of espresso is poured into a demitasse (a small espresso cup) and then a splash of hot milk is added. 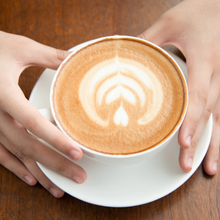 Some coffee shops will add a fine layer of foam, but many will use a microfoam, which has been very carefully created. If you’re a fan of a macchiato in the morning, the good news is that this is a relatively simple formula to get right. The first skill to perfect is making the perfect espresso. Many people have coffee machines at home, but you don’t have to have new-fangled fancy gadgets to create a coffee to rival the ones you usually grab on your commute. In fact, those with more traditional views would probably recommend more conventional techniques. 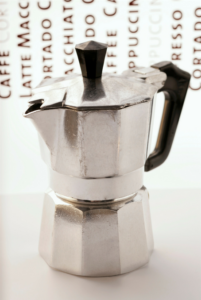 One of the most popular methods of making espresso is using a Moka pot (read how to use a Moka pot to learn more). If you go to Italy, it won’t take long for you to spot these tiny silver kettle-like appliances in the kitchens of cafes and residential properties. The Moka pot is a staple for coffee makers, and it is famed for producing smooth coffee, which hits the spot in terms of flavor. 1. To use a Moka pot to create your morning macchiato, all you need is coffee beans, a grinder, and a spoon. If you’re really desperate to get it absolutely right, you may also benefit from using a scale to weigh the beans. 2. Once the beans have been ground finely, they are added to the Moka pot with water and the pot is then placed on the stove. 3. Once the espresso is ready, you can move on to the next stage of macchiato production. This involves preparing and adding the milk. If you order a macchiato in a high street coffee chain, you may be greeted with a frothy top, stenciled patterns in the foam and coffee flavored with sweet syrup. This is not a traditional macchiato, and if you make coffee at home, you’re looking for a very fine layer of foam or frothed milk. The name macchiato means spotted or marked coffee, so you don’t want a chunky, heavy white layer. 4. Add volume to the milk very gently using a frother and then pour the milk into the espresso. Many people choose to drink a macchiato from a demitasse, or espresso cup, but serving coffee in glasses has become more popular in recent years. In this case, a small glass should be used. Who is a Macchiato Best for? If you look at a coffee menu in this day and age, the sheer number of options and melange of names can scramble your mind and confuse your taste buds. If you don’t already know which type of coffee you like, it’s worth trying new flavors to broaden your horizons, but it can be helpful to have some idea of what you’re letting yourself in for. A macchiato is often mentioned in the same sentence as an espresso and a cappuccino, two of the most popular and well-known coffee orders. The macchiato is essentially an espresso with a spot of milk. The milk creates a different flavor complex to the espresso, but the small quantity means that the coffee tastes very different to the cappuccino. In Italy, it’s traditional to start the day with a hit of strong coffee, and Italians are also averse to ordering anything that contains even a hint of cream after midday. This includes a macchiato, cappuccino or latte. 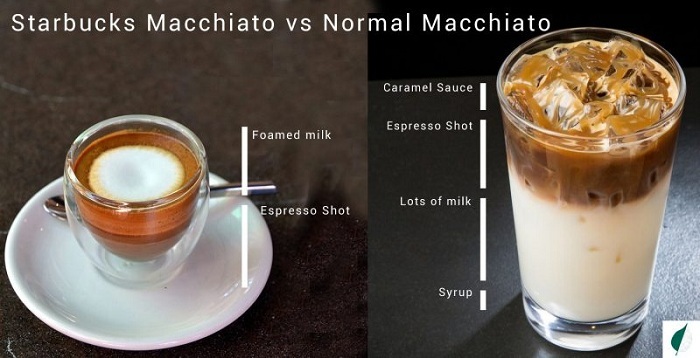 If you do fancy a macchiato, and you’re visiting Italy, it’s worth bearing this in mind. A macchiato will go down a treat provided that you’re ordering before noon. A macchiato is an ideal choice for those who don’t want the full force of acidic, rich espresso or the indulgent sweetness and creaminess of a cappuccino or a latte. On a scale, the macchiato lies between the two, and it offers the best of both worlds. The flavor is smooth and intense, the but that drop of milk just takes the edge off. If you enjoy a strong coffee in the morning, but you don’t fancy a straight-up espresso, this could be the coffee for you. If you take a trip to a trendy coffee shop in this day and age, you may find yourself faced with a list of flavor options. Traditionally, a macchiato contains just espresso and hot milk. Flavored syrups are an addition that has gathered pace in the last few years, as baristas look to jazz up traditional products and offer an alternative to the classics. Whether or not you choose to try new things is entirely up to you, but it’s worth remembering that a classic macchiato would not contain any notes of caramel or cinnamon, for example. Where is the macchiato most popular? The macchiato originated in Italy, but it is now widely available. You can order a macchiato pretty much anywhere in the world thanks to the growth of coffee shop chains and the increased popularity of coffee. In essence, a macchiato is an espresso with a splash of milk, but you may come across multiple versions of this coffee, depending on where you are and what you order. The traditional macchiato remains a staple of Italian culture, and most people tend to drink it in the mornings. It has also become a popular option for coffee fans in other Mediterranean countries, the UK, and the US. While many favor the conventional macchiato, there are plenty of people who are much more familiar with newer, more exotic versions, such as latte macchiatos and caramel macchiatos. This tends to be the case where coffee shop chains are popular. You’re more likely to stumble across somebody sipping on a coffee with a hefty layer of foam and colored syrup on the top in the UK or the US than on the streets of Rome or Venice, for example. 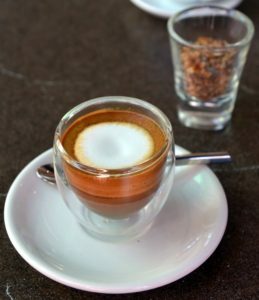 The macchiato is very similar to the cortado served in Spain and other Hispanic nations, including Mexico. The Spanish name is based on the fact that milk cuts through the espresso. There’s one major difference between the cortado and the macchiato, and this lies in the preparation of the milk. In Spain, the milk isn’t textured like in Italy, so you get a gentle splash of milk rather than a microfoam layer. Although Italy is famed for its devotion to coffee drinking, the macchiato has also become part of daily life in Kosovo, where it’s incredibly common to reach for an espresso cup shortly after the morning alarm goes off. In Australia, it’s commonplace to order a long macchiato. Typically, this contains a double shot of espresso, and a slightly more heavy-handed dash of milk served in a tall glass. If you’re a coffee fan, and you know exactly what you want, make sure you maximize your chances of satisfaction by placing the right order. Modern coffee shops and restaurants can be a minefield when it comes to ordering due to the sheer scale of options that are available. If you’re a conservative coffee drinker, and you want a macchiato that resembles those doled out in the bustling cafes of Florence or Milan, order a caffè macchiato or an espresso macchiato. If you’re not averse to being experimental or you fancy something a little sweeter than the standard macchiato, order a specific flavor or go for a latte macchiato. You can also modify your order to take allergies or intolerances into account and to add extra power with an additional shot if you feel like it could be one of those days. It’s not uncommon to order a double shot in the US and Australia, although this is not the norm in Italy. You don’t have to be a coffee lover to realize that there are a plethora of different types of coffee available out there. If you’re not familiar with the magical macchiato yet, hopefully, this guide has given you an insight into how the macchiato came about, how to make it at home, and what you need to order to make sure your taste buds are wholly satisfied. « What is a Latte Coffee?